Following the success of previous years, BGAM, in association with Drivewise Borders, will once again be offering up to 20 free places on the IAM Road Smart ‘Skills for Life’ course, as part of their drive to encourage better and safer motorcycling on local roads. The free places are available on a first come first served basis to those who attend and sign up on the day, with the up-front fee refunded upon successful completion of the course. Free 30-minute ride assessments with a qualified IAM Road Smart observer will also be available throughout the day. Over the last three years, the Scottish Borders Council, Police Scotland and The Borders Group of Advanced Motorcyclists have assisted over 40 Borders riders complete the course and pass the IAM Road Smart Advanced riders’ test. “All the partners involved are keen to reduce the number of incidents involving motorcycles in and around the Scottish Borders. One of the ways to achieve this is through education and the ‘Skills for Life’ course which aims to make motorcycle riders become ‘Thinking Riders’ through the continual use of the 5 elements of Motorcycle control; Information, Position, Speed, Gear and Acceleration. Brenda and Rod Mitchell of Peebles-based Motorcycle Law Scotland signed up last year and have been impressed by the training. “We’ve been motorcyclists all our adult lives, but we recognise the importance of continuous training and instruction. There is always something new to learn which will help ensure everyone’s safety on the roads. Places on the course are available to riders who hold a UK category A or A2 licence. 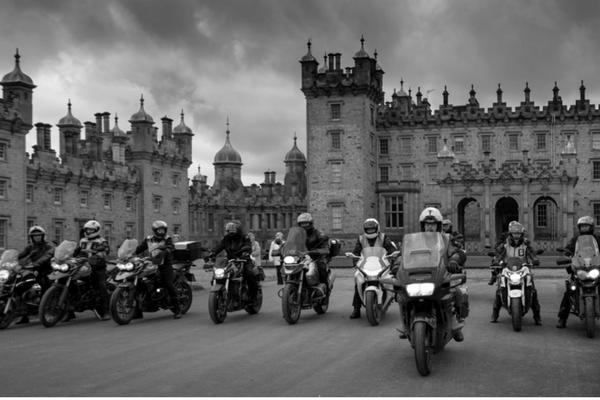 They must have a legal and roadworthy motorcycle capable of maintaining the national speed limit, commit to completing the course by March 31st, 2019 and must be residents in the Scottish Borders Council area. *The sign-up process will involve an upfront fee of £149 and a non-refundable contribution to your observers costs currently £30. The fee for the course will be refunded upon successful completion of the course and passing of the test. Representatives from Police Scotland, Scottish Fire and Rescue, Scottish Ambulance, Blood Bikes Scotland and many others, including some local traders will also be present at BGAM’s Open Day and refreshments will be available.